District Judge Kristine Baker&apos;s order came hours after Arkansas Governor Asa Hutchinson dismissed calls for an in-depth review. 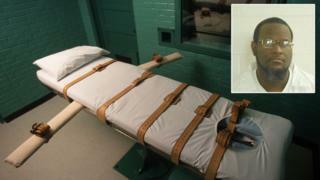 Kenneth Williams, the fourth prisoner executed in eight days, convulsed and groaned, witnesses said. His lawyers described his death on Thursday as "horrifying". In addition to the examination, Judge Baker also ordered the preservation of blood and tissue samples from Williams&apos;s body. Her decision came after Jason McGhee, a death-row inmate who had also been scheduled to die on Thursday, filed an emergency order. He and three others who had been scheduled to die before the state&apos;s supply of sedative - part of the lethal injection used to execute prisoners - runs out have all won reprieves. Earlier, Governor Hutchinson had rejected calls for anything more than a "routine" check into the execution, while Senator Trent Garner - who witnessed the execution - said Williams did not "seem in pain". But Shawn Nolan, who represented Williams, filed a motion which argued that if "the [drug] midazolam fails to keep the prisoner under anaesthesia, the prisoner would be awake and aware but unable to move or speak or even open his eyes, so he would then look completely serene despite being in agony". Williams was initially spared the death penalty when he was sentenced to life in prison for the 1998 murder of 19-year-old cheerleader Dominique Hurd. After a month in the penitentiary, he escaped in October 1999 by hiding in a barrel used to carry kitchen refuse. Not far from the prison, he encountered Cecil Boren, 57, on his farm. He killed Mr Boren, shooting him multiple times, and stole his Ford F-150 pick-up truck. Williams drove north to Missouri, where he led police on a chase that caused the high-speed death of 24-year-old delivery driver Michael Greenwood. After being jailed, Williams became an ordained Protestant minister, and wrote his autobiography as well as a book warning against gang life.